Princess Victoria of Sweden dazzles in royal blue dress | HELLO! 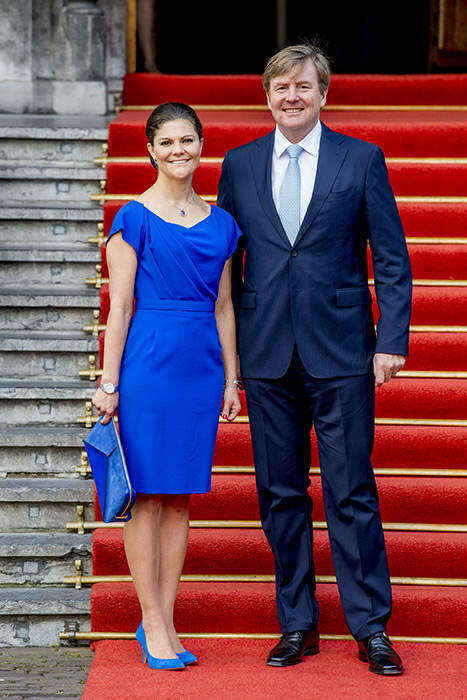 Crown Princess Victoria of Sweden was fittingly dressed head-to-toe in royal blue for an engagement in The Hague, where she met with King Willem-Alexander of the Netherlands. The fashion-forward princess looked radiant in the colourful summer number, designed by luxury label Escada. The German brand is popular with Hollywood's A-listers and models including Miranda Kerr, Olivia Palermo, Angelina Jolie and Helen Mirren. Victoria looked the queen of coordination, matching her chic pencil dress with blue suede shoes and a blue clutch. The 39-year-old, whose dress is currently sold out, completed her royal look with a blue diamond necklace and earrings set. Victoria was in The Hague to attend a ceremony marking the 20th anniversary of the Organisation for the Prohibition of Chemical Weapons. She gave one of the keynote speeches, while King Willem-Alexander unveiled a plaque acknowledging the organisation's anniversary. The fleeting visit comes shortly after the Swedish royal went on a four-day state visit to Japan. Victoria, who left her husband Prince Daniel and the couple's two children Princess Estelle and Prince Oscar at home, was hosted by Emperor Akihito and Empress Michiko. Visiting in her capacity as ambassador for the UN's Sustainable Development Goals, Victoria explored sustainability, marine and fishery issues during her trip. On a visit to the United Nations University in Tokyo, eagle-eyed fans noticed that the polka dot navy blue dress Victoria wore was in fact borrowed from her mother's wardrobe. Queen Silvia wore the frock back in 1987, but Victoria, a fan of recycling her outfits, managed to breathe new life into the vintage number. Crown Princess Victoria of Sweden has 18 royal godchildren! Is Crown Princess Victoria of Sweden planning on having a home birth?